There are some artists who define their generation, and become something more than musicians. They go beyond the realm of what was thought to be possible for someone in their genre. They then take the genre with them to new heights, and leave it in a better place than it was when they began. For hip-hop, that artist is Tupac Shakur. Tupac Shakur, or 2Pac, was an American rapper in 1990’s who spoke about the world he saw around him, and the world he hoped to see in the future. He had a brash exterior and could have a volatile temper at times, but he spoke of peace and a brighter day through his music. He predicted his own demise and became a martyr whose presence still resonates today. From the his album All Eyez On Me, the single “California Love” may be his most well known and biggest hit. As an ode to the California he grew to come home, Pac not only glorifies the lifestyle on the West Coast, but he celebrates the people and love that makes it like no other place in the world. Arriving at the swap meet. The song was originally recorded by Dr. Dre as a solo song for himself, but after 2Pac heard the track, he begged Dre to put him on it. The result is an instant hip-hop classic that features funk legend Roger Troutman singing the hook through his signature talk box. The beat grooves so incredibly well and encapsulates West Coast Hip-Hop so incredibly well that it’s the gold standard when it comes to the genre. Pac gives a major shout out to chucks in his verse, rapping that “in L.A. we wear chucks not Bally’s”, solidifying chucks as THE shoe for West Coast Rap. Off to another California party. The music video features Pac and Dre starting out their day by heading to the Compton Swap Meet to pick up some new gear. It’s here where we see Pac wearing a pair of all white chucks with his black khakis. They then make their way to Dre’s house for the party he’s throwing. Here we see what would become the stereotype for hip-hop music videos with plenty of booze, women, and cash being flung around. 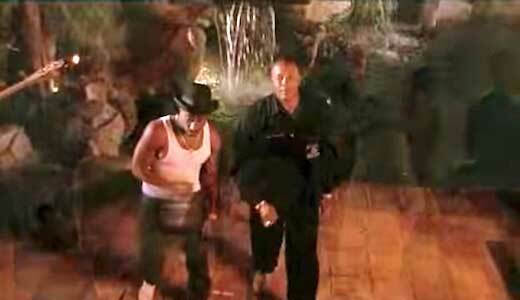 This music video is iconic as an image of what the peak of West Coast Hip-Hop looked like. Soon after this, Dr. Dre left Death Row Records, and Tupac Shakur was shot dead on the Las Vegas strip, in a murder that still goes unsolved. The West Coast rap scene never recovered, and truth be told, neither did the genre of hip-hop as a whole. He may have lived fast and died young, but Tupac Shakur left an indelible legacy that will never be forgotten. Dre and Pac enjoying the California nights. Celebrate your California Love in a new pair of chucks. Touch or click on the links below to order a pair.